The North East of Scotland has an unmatched wealth of traditional folk songs. Iona Fyfe is one of a wonderful generation of new young artists keeping these traditions alive and flourishing. With a super pure vocals and highly quality musicanship, arrangement and songwriting Iona's very impressive new debut album 'Away From The Window' is one to be savoured and cherished. It's one that will take you on a wonderful journey of discovery taken by the hand by Iona and her very accomplshed band. At just twenty-years-old, Iona has already established a strong repertoire and was nominated as 'Scots Singer of the Year' at the MG ALBA Scots Trad Music Awards in 2017. She was also a finalist in the BBC Radio Scotland 'Young Traditional Musician of the Year'. Iona has been described as “one of the best that Scotland has to offer.” and I would agree with that aapraisal. 'Away From My Window' features archive material of singers such as Stanley Robertson and Lizzie Higgins whilst drawing on the work of more recent song makers such as Michael Marra and Aidan Moffat (Arab Strap). 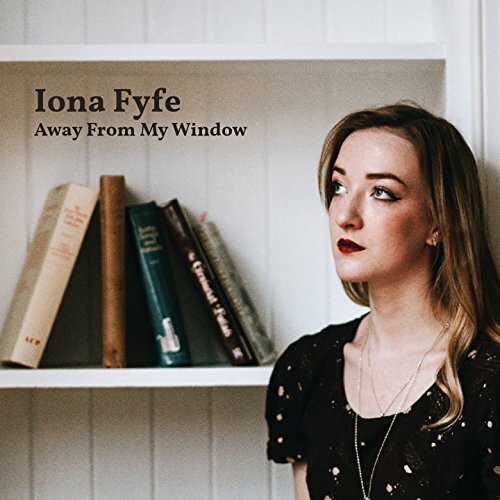 Iona comments "'Away From The Window' is a concept album which celebrates folk song revivalism and encourages the idea that folk song is an ever changing artform, which ebbs and flows with time and genre. The album is a collection iof songs, some of which originate in Aberdeenshire as bothy ballads, some of which are sung in different variants the world over and some which are written by Scots songmakers. This album is an exploration of my changing and broadening musical style, using archive samples of source songs and digitally programmed accompaniments to develop and arrange ballads, bothy ballads, self-penned and contemporary songs alike. I hope that the album pushes boundaries, whilst remaining sympathetic to the traditional which I grew up around"
The album was recorded at Gran's House studio and produced, engineered and mixed by Jani Lang of Dallahan. Iona has enlisted the help of a stellar group of musicians including Luc McNally (Dosca), Tim Edey (Tim Edey Trio), Charlie Grey (Charlie Grey and Joseph Peach), Simon Gall (Salsa Celtica), David Foley (RURA), Graham Rorie (Gnoss), Charlie Stewart and Ross Miller. 'Away From My Window' was premiered at a sold out Celtic Connections performance featuring a larger musical ensemble and live on-stage sampling of source singers. In 2018, Iona looks forward to a busy touring schedule in the UK, Germany, France, Austria, Italy, Switzerland, Holland and Canada including festivals such as Ely Folk Festival, Folk am Neckar, Fife Sing and Festival Interceltique de Lorient. The album opens with the very catchy 'Guise Of Tough' a traditional bothy ballad from the singing of Jock Duncan. It's spritely and full of life and character. The song is about a farm worker who is hired by Jimmy Broon. After an initial meal of bread and cheese, he quickly becomes disappointed in the quality of the horses he has been given and the plough doesn't work either. The beautiful 'Glenlogie' is a traditional song taken from the singing of Shephard, Spiers and Watson. Jean falls in love with a man far above her station Lord John, who also has another lover. Jean claims that she will die of a broken heart and asks her father's chaplain to write a letter to him. Lord John reads the letter, finds Jean and then offers to marry her. An unusually very happy ending for a folk song :) Glenlogie is one of the most popular North East ballads. 'Banks Of Inverurie' a wonderful traditional song taken from the singing of Shona Donaldson. It's a song of rejection and echoes the form and structure of the American folk song. The origins of the song are unknown, but it is thought that in was written in Scotland and was brought to America by soldiers from the British army in 1812. 'The Swan Swims' is a lovely traditional ballad learned from the singing of Pete Coe and Alice Jones. It is taken from one of the most popular ballads commonly known as 'The Twa Sisters'. I love the border pipes section by Ross Miller. The title track 'Away From My Window' is a traditional song taken from the singing of Stanley Robertson. It tells the tale of a young girl robbing a bank with her partner. The girl is caught at the scene but the man escapes leaving her behind to face justice. With it's great range the song of longing and place 'Bonny Udny' is a traditional ballad taken from the singing of Lizzie Higgins and Jane Turniff. 'Take Me Out Drinking' is a cover of a Michael Marra song which was first released on his 1980's album 'The Midas Touch'. We stay in the modern era for the beautiful lullaby 'And So Must We Rest' is by Aidan Moffat. It's taken from Aidan Moffat's and Bill Wells 2011 album 'Everythings Getting Older'. The only self penned song on the album is the thought-proking 'Banks of The Tigris' themed on current events and conflict in Syria and the MIddle East. The melody is inspired by the tune of 'Blue Breezin Blind Drunk'. On the strength of this high quality song it would be wonderful to see further songwriting from Iona on her next release. The album closes with the tradional Ban Shire bothy ballad 'Pit Gair'. The song dates back to at least 1869 when farming in the North East was at the edge of improvement and mechanisation. The song also contains the traditional tune 'The Fuddler'.